What Makes a Great Leader? Are You On the Journey? What makes a great leader? We must be able to know before we hire people to lead. Today I have 3 examples of real journeys to great leadership ability. Let’s take my path first. I went to West Point and learned a lot about leadership there. However, in the following Quote, I gained some clarity. Jesus lived that way and died that way. He attracted 1 Billion followers. How did he do it? He knew who he was. He never wasted time proving himself. I also while at West Point read a book called Be the Leader You Were Meant to Be. I wanted some skills to get soldiers to obey me. The first 16 chapters were about Be (question of who we are), and the last one was about Do (skills). I got the point. People should want to follow us. If they only must follow us or are manipulated by us. we are losing. That worked so well in the Army. At the same time, I also saw that Jesus was not a doormat. I realized that he was the world’s best facilitator. More could be done through people I led than through my own efforts. That is my life’s work. I wanted to learn how to facilitate the success of those who do the real work. That is leadership. 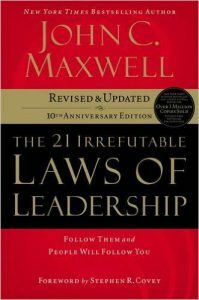 My GM, Paul Wang, read a book by John Maxwell on the 21 Irrefutable Laws of Leadership and learned he should have a mentor. He saw I could get people to want to follow me, and he asked me to mentor him. His journey thus began and has many more stories. Diane Ryan,PHD tells another moving story here. Do click on this and feel what she writes about in just 500 words. I needed a few pushes and then a lifelong pursuit to be more than do. Paul fell across a good book and committed to a mentor. Diane needed her father as a model and then a letter from a bus rider. We never ask candidates what makes a good leader. Anyone can expound a good theory. Anyone can even say what they do that leaders should do. We ask about their whole leadership path to see if it makes sense. Or are they just making up stories? We talk to people about their past experience to closely check if it adds up. Of course, we also background check to ensure we saw it right. Can you see in these stories how Paul, Diane and I gained leadership thinking? It does not fall out of the sky. We all start with nothing and develop. Leaders are made and not born. West Point has used that thinking for over 200 years. That’s why they are so successful. You can be too. See Also Leadership Is All About People Be People Centered. Neither Paul, Diane, nor myself are saying we arrived. It is a journey. I play soccer on Sundays. My teenage daughter who also plays observed something and told me. That is super well said. I am so glad to have a daughter like this. How much better if I did not play to prove myself. The journey continues. In conclusion, have you thought about your own journey? Do your recruiters know what leadership is? Have they tasted it? Are they on the journey? Do the leaders that you have hired? A look at all of these is super important to your success here in China.